Maisy and the Money Marauder by Elizabeth Woodrum is a book written for children between the ages of seven to twelve. The story, recounted by fourth-grader Maisy, consists of fifteen chapters of varying lengths, but none too long to be read by a child at one sitting. The first, which runs to less than five hundred words, lets Maisy introduce herself. It establishes her as an only child, with a pet dog, who loves old monochrome mystery movies featuring detectives whom she seeks to emulate. Any questions readers of the first book in the series might have are answered in a way that intrigues rather than cluttering the text with too much detail. West Valley Elementary School exists, or it does for the time it takes to read Maisy and the Money Marauder. Maisy lives: she’s likeable, different, and yet not too perfect; she struggles with arithmetic. The crime she is determined to solve is petty theft, but the girl she suspects is the perpetrator does have a reason to steal, though Ms Woodrum ensures readers will be left in no doubt that theft is wrong. I particularly enjoyed the clever use of Maisy’s detective personae, complete with homburg hat, and the way her deductions, made from the clues she finds, lead her onwards. The majority of the vocabulary is within that with which most seven-year-olds and up could cope and the word “marauder”, which is likely to be new, is explained: both the meaning and how to pronounce it. 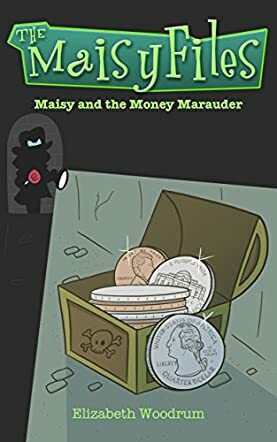 Maisy and the Money Marauder cannot fail to entertain and encourage independent reading for pleasure and any parent can download it with confidence.